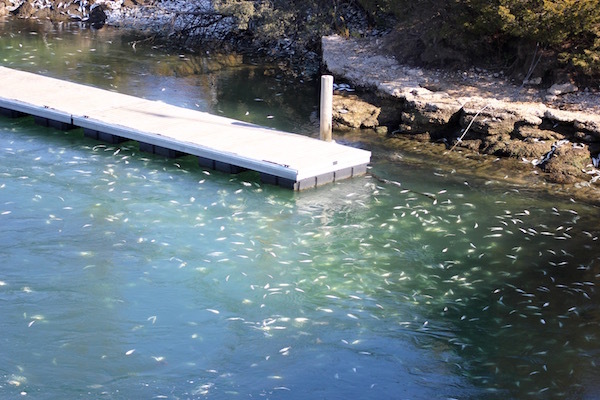 In the early hours of Monday morning, fishermen and early risers noticed a strange glinting sheen on the waters of the Shinnecock Canal just south of the locks in Hampton Bays. 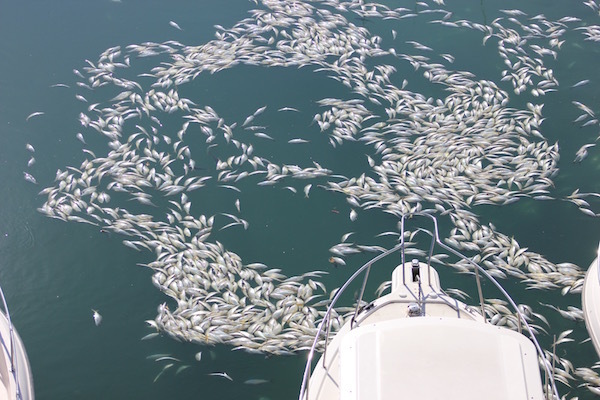 A massive die-off of the bait fish menhaden, known locally as bunker, was underway, a strange sight for an area not prone to fish kills, at a time of year fish kills are unlikely to occur here. 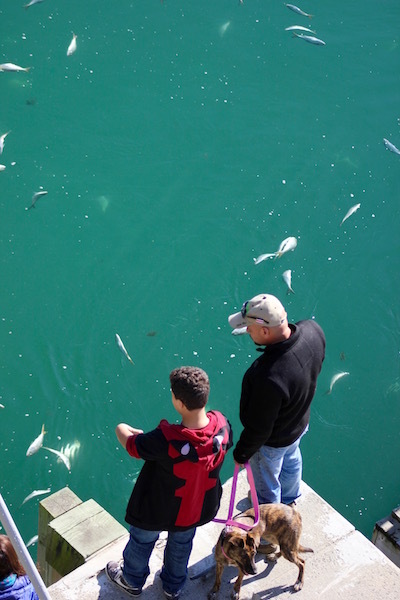 By mid-morning, a crowd had gathered on the Montauk Highway bridge over the canal, after the locks opened at 9:30 a.m., washing the fish out into Shinnecock Bay on the outgoing tide. Felix Set of Hampton Bays had been watching the dead fish float by from the top of the bridge for about an hour at 11 a.m.
Mr. Set said he was suspicious of the green tint to the water, and wondered if pollution had caused the die-off, but Peconic Baykeeper Sean O’Neill, who was also looking down into the swirling water from the top of the bridge, had another theory. 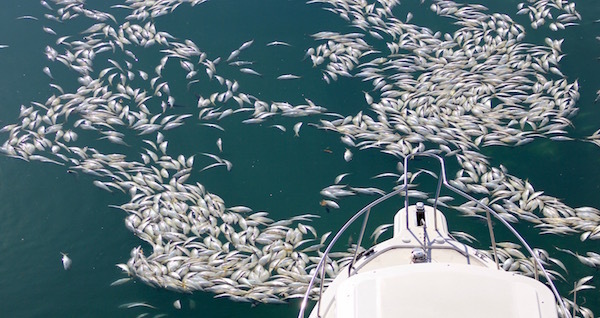 Mr. O’Neill said that this time of year, most bunker are migrating out to the open ocean, and they were likely backed into the locks by predatory bluefish and striped bass overnight, aided by the strong tide of the super-moon, which is at its closest to the earth tonight as it has been in 69 years. 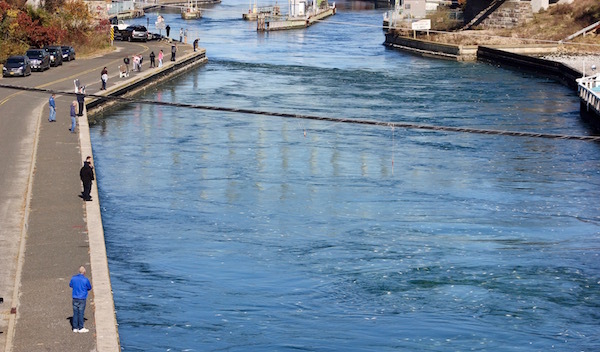 While packed in at the locks, he said, they likely ran out of oxygen to breathe and asphyxiated. 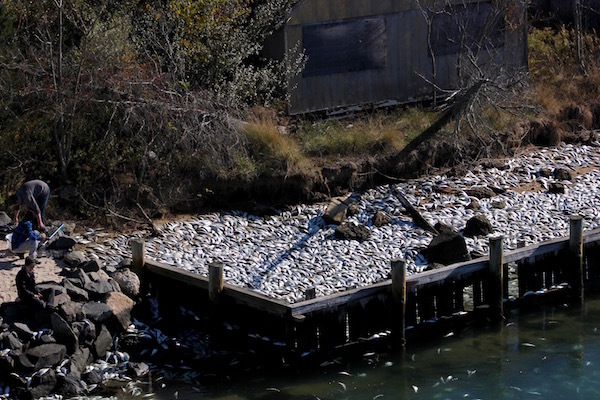 Mr. O’Neill said that scientists from the nearby Stony Brook Southampton Marine Station had sampled the water earlier this morning to see if there were any water quality factors amiss, and that the Southampton Town Trustees and Bay Constables were working with commercial fishermen on a plan to clean up the dead fish strewn along the banks of the canal south of the locks. 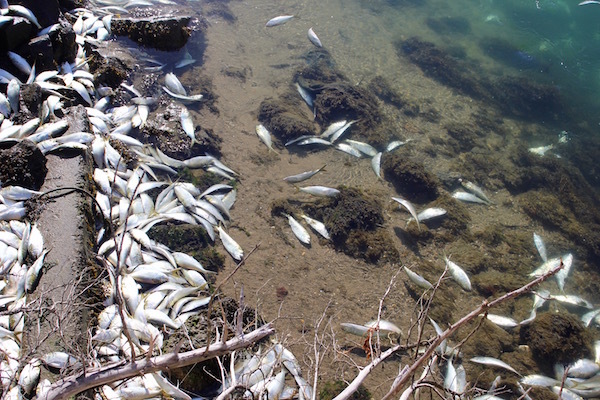 The spring and early summer of 2015 saw several major die-offs of bunker in the Peconic River and the western end of the Peconic Bay, driven by large numbers of fish and a nitrogen-fed algae bloom that helped feed the hypoxic conditions. 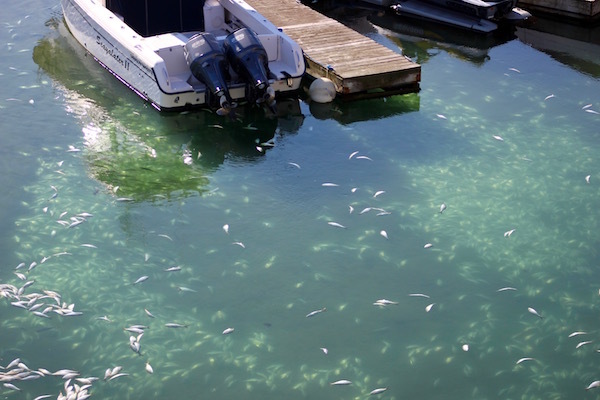 But these types of algae blooms occur in warm weather, not in mid-November. 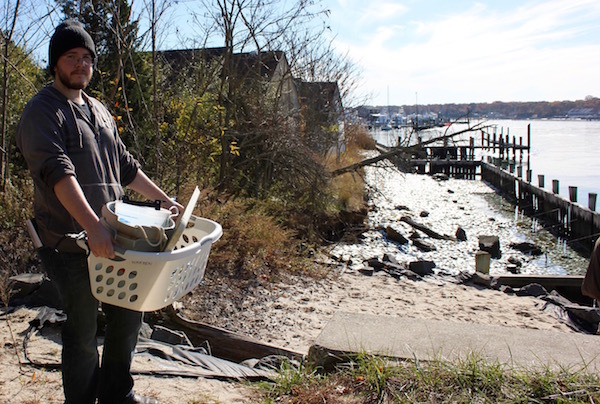 Riverhead and Southampton towns both paid fishermen this year to cull the explosion in the population of bunker that occurred again in the Peconic River this spring, and though algae levels were high, there was no die-off this spring. Mr. O’Neill said the large bunker population is in part due to new restrictions on bunker harvest throughout the mid-Atlantic region. Though fishermen on the East End only harvest bunker for bait, they are commercially processed for pet food and fish oil supplements in other areas such as the Chesapeake. Not far down the bridge, Jahayre Naranjo was photographing the dead fish while walking her dog. 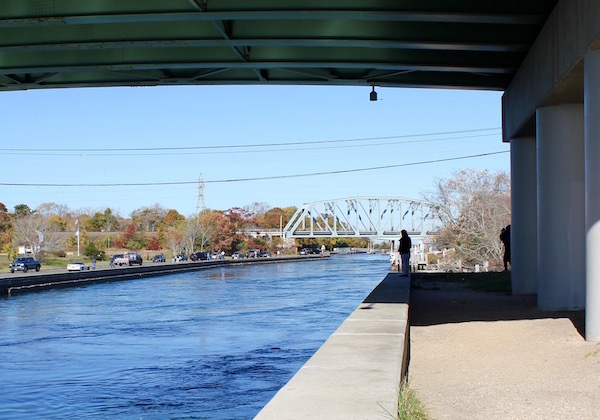 Under the bridge, researcher Brandyn Lucca with Joseph Warren’s Acoustic Oceanography lab at Stony Brook Southampton, was gathering fish into tubs, measuring their length and body weight. He said most of the fish were about a foot long and appeared to be mostly older than one year. 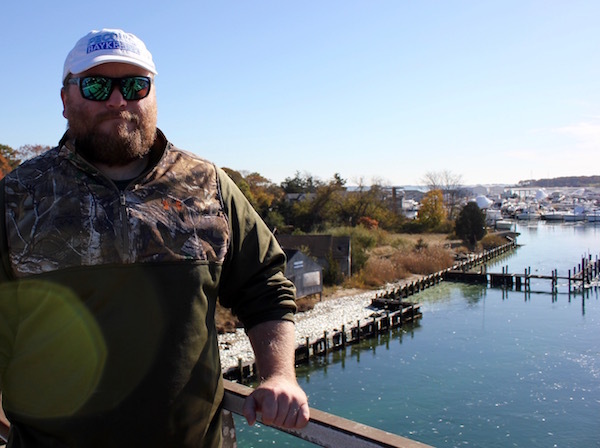 The lab, where he’s worked for three years, uses acoustic imagery to survey the biomass of fish throughout Flanders Bay and the Peconic River. There are also thousands of dead Bunkers on the beaches . I live in Quogue and they are lined up for miles. Should they all be left there or removed ?